It seems we’ve reached an era where board games are obsolete. All kids have an XBOX, but rarely do you walk in a home and see games like Battleship and Connect 4 anymore. There’s just no getting around it. I for one have embraced it, but as a trade-off my children started indulging me in board games last year. What began as an activity I forced on them, has become a practice they engage in of their own fruition. Let me tell ya, it makes me one happy mama when I see them playing board games. My husband and I have made an intentional decision that we want our sons to be thinkers. We believe that board games will help them to accomplish this mission. By choosing the right board games for our boys, I believe we can give them a leg up on the thinking game. 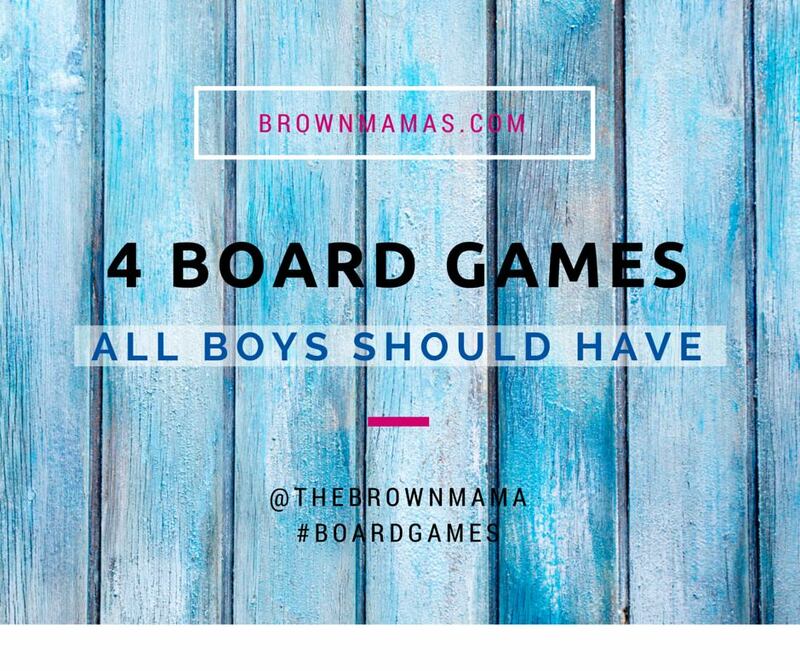 Here are 4 board games we believe are essential in raising African-American boys. This is the ultimate and oldest game of strategy known to modern men. It was said in Ancient Africa, that chess games decided the fate of wars between districts in disagreement. Three years ago I purchased a book entitled Chess Primer that teaches both the history and game of chess. Chess takes years to master, therefore requires much patience on the part of the players. But once our boys have mastered this game, the application to life will be priceless. Knowledge is not the only form of powers, words, or should I say the comprehension of words, is equally powerful. Starting your kids off with Junior Scrabble, and upgrading the game throughout the years, can help with early word comprehension, gives your child’s confidence in reading and builds their vocabulary. One of the biggest problem, brown children face at school is reading comprehension. Adults who master the English language and have an accurate understanding of the meaning of words and the context they should be used in are less easily fooled. This game seems very simple and easy, and honestly, it is. But for kids ages 3-5, Connect 4 is about learning how to beat mom and dad. It is very easy to win this game against a similarly aged brother or sister, but against mom or dad, you’ve got to learn that there is a pattern to winning Connect 4. Once your kids have picked up on the pattern, you’ll have a hell of a time beating them. Or, if you’re my family, the kids will adapt their own strategy to the pattern you’ve taught them and the parents will become the consistent Connect 4 losers. This game is a great confidence builder for teaching children to play more tactical board games. Those are games the Mendoza family plays. What games do you play with your boys?